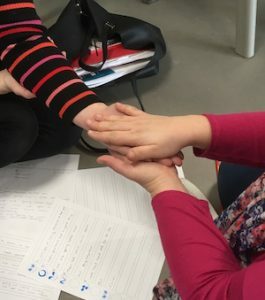 What are the practical implications of introducing Story Massage to a class of children with PMLD? And how can these be overcome? Here are some helpful guidelines from class teacher, Heather North, Lexden Springs Special School and winner of a Best Practice Award. 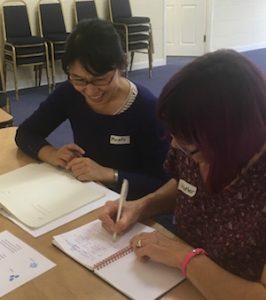 Indeed, Heather, who is pictured below (right) on a training day, found Story Massage to be so beneficial that she wrote a special massage story as a fun way of presenting her work at a teachers’ meeting! 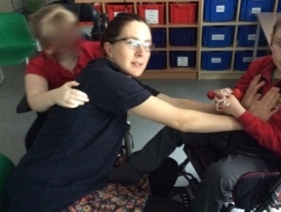 Before looking at Heather’s suggestions for implementing Story Massage in a class of pupils (aged 6-10 years) with PMLD, take some time to enjoy her massage story which is an ideal summary of her experiences. Green Class consists of 11 children with Profound and Multiple Learning Difficulties (PMLD) and global development delay. Pupils range in age from 6 – 10. One child has a few spoken and signed words. The other children rely on vocalisations, facial expressions and body movements. Two children have multi-sensory impairments and two children are on the Autistic Spectrum. Many of the children have complex medical needs and require tube feeding. There are six members of staff including the teacher. Heather explains how she has worked to create Story Massage sessions that are fully inclusive for all children in her class. 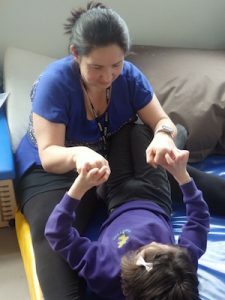 Heather introduced the idea of Story Massage at a teachers’ meeting and then put time aside to show staff in Green Class how to do the ten strokes and talk about the benefits of positive, respectful touch through Story Massage activities. This was an ideal time for staff to ask questions and work together to share ideas for how it would best benefits their pupils. The staff are aware that they are not trained in Story Massage and work under the guidance of Heather. (Some are planning to attend a training day in the future). Heather says that Green Class tends to be rather busy, noisy and cluttered so she dimmed the lights and pulled down the blinds to help create a calmer environment for sessions. Heather was concerned that it would be difficult to to get to children’s backs because of specialist seating. And there was not sufficient time for getting children out of chairs. 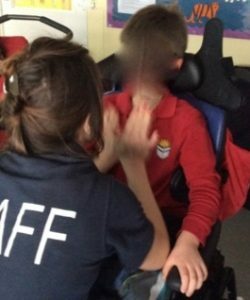 Heather has also introduced a bench into Green Class where those who are physically able can sit to have their Story Massage session. This has worked well for Heather. “I have linked in to English, PHSE and Humanities through adapting existing stories or by writing my own,” she explains. You can see a video of Heather’s wonderfully creative massage story about the history of transport below. And the results of the assessment process are below. This was gained through observation, photographs, video clips, assessment sheets and staff feedback forms. They are calmer during and after the session. They are increasingly showing signs of anticipation (by tensing, breath holding, vocalising, smiling etc.). 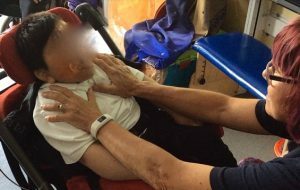 They are increasingly demonstrating preferences for strokes (using facial expressions, body movements, vocalisations etc.). They are more accepting of touch. Increasingly indicating they want ‘more’ to the adult through spoken word, supported signing, vocalisations etc. They are more responsive to the adult working with them. One girl in particular has been able to do it on an adult although she is not yet ready to work with another child. She has also started to try and ‘tell’ the story with the lead adult. Story Massage combines the benefits of positive, respectful touch with the creativity and engagement of storytelling. Ten simple massage strokes form the basis of the Story Massage programme. These strokes have a child friendly name, such as The Circle or The Sprinkle, and an easy to recognise symbol making it accessible for all. It is a fully inclusive activity, no clothing is removed and no oil is used. Stories can be taken from our Story Massage book, adapted from favourite stories or songs. or you can even create your own stories like Story Massage in Green Class! 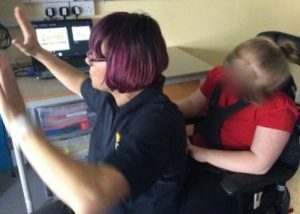 Are you inspired by the way that Heather is using sensory stories with children with PMLD? Would you like to train to use Story Massage in your work or home? We run a one day accredited training courses held around the country for individuals and groups. These days can also be organised as in-house training sessions. And we have a new online training option.